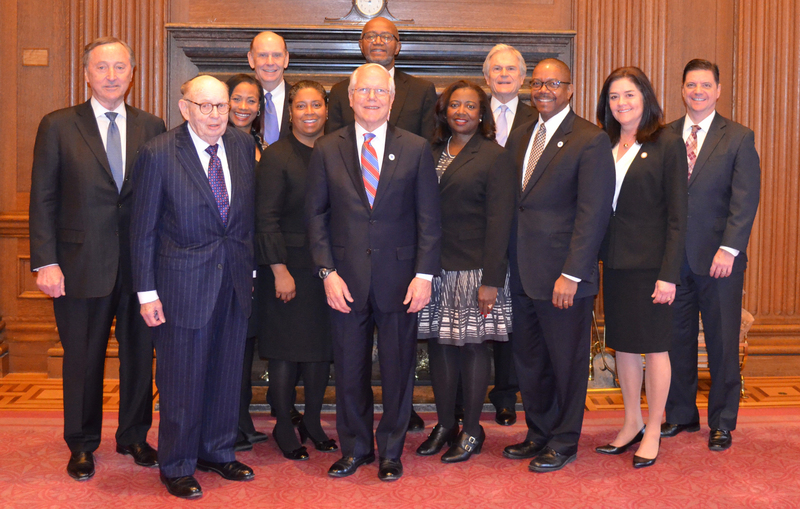 Nine UK Law alumni were recently admitted as members of the United States Supreme Court Bar. The alumni were joined by Dean David A. Brennen and his wife, Kimberly Brennen, who were also admitted. John McGarvey, a 1973 UK Law graduate, served as the movant for the group to be admitted to the Bar. Chief Justice John G. Roberts presided over the proceeding before the full court, with the exception of Associate Justice Ruth Bader Ginsburg, and admitted the candidates to the Bar. UK Law alumni who were admitted include: Angela Edwards, Charles English, Charles “Buzz” English, Jr., E. Edward Glasscock, LaToi Mayo, John McNeill, Russell Morgan, Lou Anna Red Corn and Steve Ruschell. Additional UK Law alumni who traveled to D.C. and attended the ceremony to support those being admitted include: Luke Morgan, Melissa Moore Murphy, and Cassidy Rosenthal. “It was a wonderful experience and we are all better for it,” said Lou Anna Red Corn, a 1984 graduate of UK Law. Following the special recognition, the newly admitted members of the Bar and their guests had the privilege of remaining to hear two cases before the Court. In addition to having access to limited, preferred seating behind attorneys arguing a case in the Court, Bar members may try cases before the U.S. Supreme Court and have access to the Court’s library for research and study. Five of the current Supreme Court Justices have visited the University of Kentucky College of Law within the past six years. This list includes: Chief Justice John G. Roberts and Associate Justices Clarence Thomas, Samuel A. Alito, Jr., Elena Kagan, and Neil M. Gorsuch. While visiting the nation’s capital, the UK Law alumni were welcomed by 6th District Congressman Andy Barr, a 2001 UK Law graduate, and enjoyed a private tour of the Capitol that included a brief stop to see the office of Senate Majority Leader Mitch McConnell, a 1967 graduate of UK Law. The University of Kentucky Alumni Association was a strong partner in coordinating this multi-event effort in Washington, D.C., with Associate Vice President for Alumni Engagement, Tim Walsh, and Alumni Engagement Coordinator, Nathan Darce, accompanying the group as well as UK Law staff and alumni, Danny Murphy, Assistant Dean of Community Engagement & Diversity, and Laurel Hostetter, Interim Director of Philanthropy. In addition to the swearing-in ceremony, visit with Representative Barr, and tour of the Capitol, UK Law alumnus Raymond Stewart of Thompson Coburn LLP hosted a reception at his firm for D.C. area UK Law alumni. At the reception, Dean Brennen shared College of Law updates. He noted that this year UK Law welcomed one of its most diverse classes, whose members are collectively experiencing a strong start in their law school career. He highlighted the production of impactful scholarship by UK Law’s world-class faculty, which includes Cortney E. Lollar, James and Mary Lassiter Associate Professor of Law at UK Law, recently being cited in a U.S. Supreme Court decision in which Justice Gorsuch, joined by Justice Sotomayer, dissented from the majority’s denial of centiorari. Dean Brennen also shared an update on the progress of the Law Building construction project that remains on-budget and on-schedule for completion by July 2019.